Following on from the successful crowd-funding campaign to help establish Teenage Markets, it’s exciting to hear about an imaginative project for younger children. 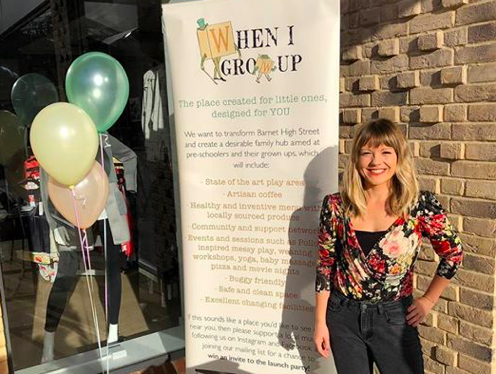 Local mum, Jo Merchant, is hoping to open a family hub for Chipping Barnet early next year called When I Grow Up. The idea is to use premises on the High Street to create a space for parents and carers to take their children where they can play, get creative and make new friends. The grown-ups will be able to relax over decent coffee and other drinks from the café which will also serve a menu of freshly made food. By being on the High Street, many local families should be able to reach it on foot and it would have a strong visible presence. Although we’re on the edge of London within access of a number of child-friendly spaces, many are a drive away, and, in the immediate vicinity, opportunities are surprisingly limited. This is only getting worse with the closure of children’s centres and the libraries that are still open are frequently unmanned and unwelcoming to children. Like the Teenage Markets, this is another local project of great benefit to the community we help bring to fruition. Please pledge here to show your support with just £2 and a few words expressing its likely benefits. The Mayor of London will be looking at the project on 8th October and the crowd-funding campaign will end on 17th December by which time they hope to have raised almost £111,000.